Overview of genetic engineering experiments using MuLE vectors. (A) Restriction enzyme cloning is used to generate MuLE Entry vectors with a desired genetic insert cloned downstream of a desired promoter (P), with the entire promoter-insert element being surrounded by appropriate attL-attR sites. 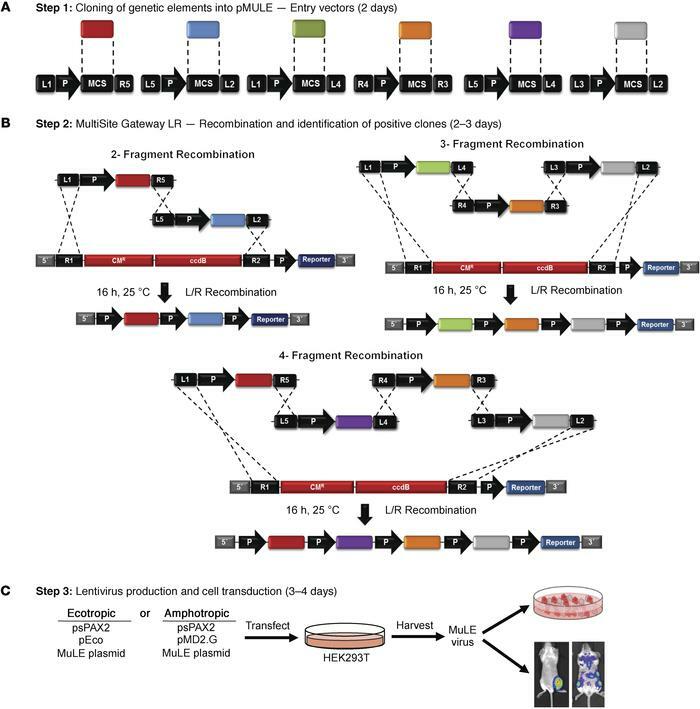 (B) Schematic overview of the MultiSite Gateway–based recombination cloning of 2, 3, or 4 MuLE Entry vectors into lentiviral destination vectors to generate multicistronic MuLE lentiviral expression vectors. The specific attL-attR sites that mediate each recombination are depicted. CMR, chloramphenicol resistance gene; ccdB, ccdB toxin gene. (C) Transfection of 293T cells with a MuLE expression vector plasmid together with a lentiviral packaging vector (psPAX2) and a vector encoding either amphotropic (MD2G) or ecotropic (pEco) envelope proteins generates MuLE lentiviruses for transduction of cultured cells or for in vivo injection into mouse tissues.